Two members of the team behind local success story Small Batch Coffee have teamed up for an exciting café venture on the newly-renovated Level in Brighton. 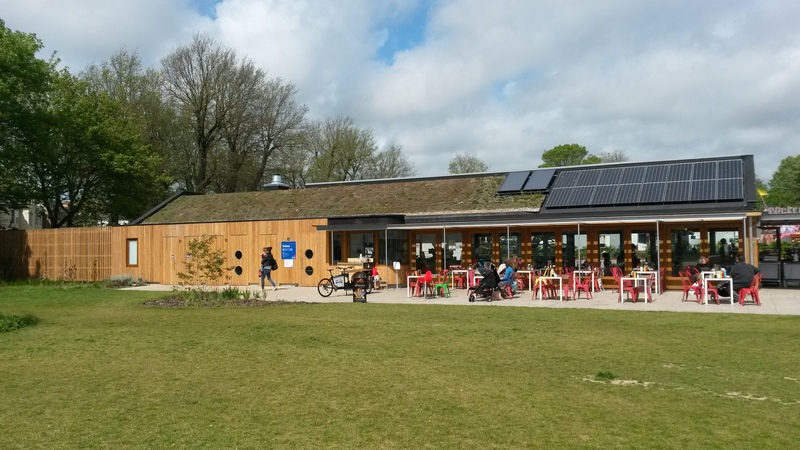 Planning was sought in August 2011 by Brighton & Hove City Council for a building housing a café, public toilet and gardeners’ mess to replace a much smaller gardeners’ hut that was on the site already. The derelict hut had previously been home to property auctioneers Clive Emson. The attractive glass, timber and steel structure is situated just south of the fabulous new skatepark. The exterior of the building was designed by Sasha Bhavan of London-based architectural practice Knox Bhavan. The roof features eight photo-voltaic panels and two solar thermal. The rest is grass. In fact, the rest is a combination of 29 different wildflower and grass varieties (32% crested dogstail all the way down to 0.1% harebell) according to the planning application. The Level was laid out in 1822 by Amon Henry Wilds (architect of Park Crescent and Hanover Crescent) and Henry Phillips (the renowned landscape gardener). Cricket is often mentioned in its history and was played there from the mid-1800s. 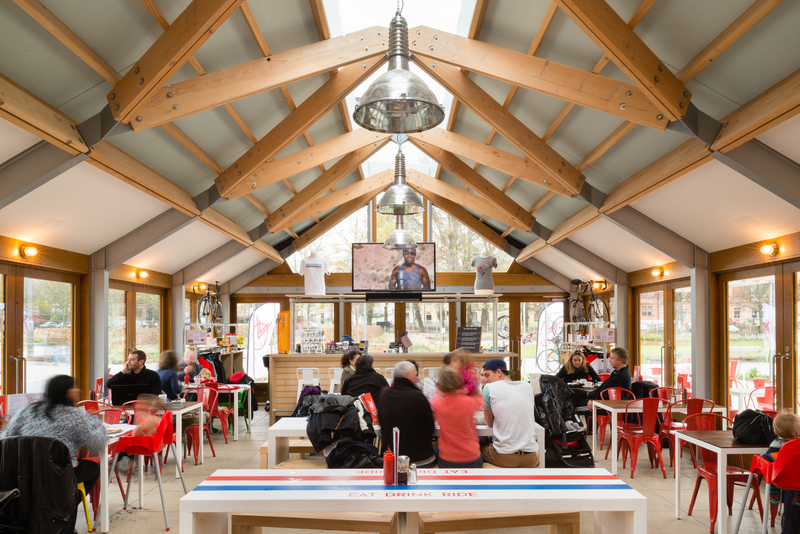 Sport – cycling to be precise – is a prominent theme at the new café, Velo, which is the brainchild of Nigel Lambe from Small Batch. Much of the interior of the building, including lots of the furniture, was designed by Paul Nicholson, who has been mentioned many times in this column, from Brighton-based Chalk Architecture. Paul is also responsible for the interiors and styling generally of the various Small Batch outlets throughout the city. Many other local firms have been involved in the fit-out. Lucien Hewetson at Didfafab made the tables, and Nik the Brush painted them along with much of the signage. Lighting was sourced by the Brighton Design Workshop. The prominent hanging lights were salvaged from an Indian Air Force hangar. The bulkhead lights came from a passenger ship. Velo provides a lovely environment in which to eat and sip coffee, and it caters for around 60, but, as the name suggests, it is more than just a café. Bike servicing takes place on the premises too. Paul is a perfectionist and insists that more work is to take place including the design of a new logo which I was hoping to print here. But just as rideouts from Velo leave sharply on Sundays at 8:30am, I have a deadline too.